The demise of streetcar systems like this one in Los Angeles was probably not due to their being bought out and shut down by car companies. Picture from the Huffington Post. When I tell somebody about my research, they often bring up the alleged General Motors Streetcar Conspiracy, a popular folk-tale in the history of American transport. The story goes something like this: At the early twentieth century, virtually every major North American city had a streetcar system, which was basically a lower-tech version of what still exists in a few cities such as Toronto and San Francisco. These systems posed a problem for the rapidly expanding car industry, and so a few car companies (most notably General Motors) bought out many local streetcar systems and immediately shut them down, in order to push the United States towards dependency on the private automobile. Now I’m just a lowly PhD student, and my research focuses on intercity transport rather than urban transport. So there are many people more qualified than me to comment on whether or not this actually happened. What I can do is point to a few of these people and the arguments they make. An excellent paper to read if you’re interested in this history is Zachary Schragg’s The Bus is Young and Honest. According to Schragg, the elimination of the New York City streetcars was more due to the bad reputation then held by streetcar companies than to any shady dealing by automobile executives. Like most forms of private transport infrastructure, New York’s streetcars functioned essentially as a monopoly. While some legislation tried to counteract this, for example by legally imposing a fare of a nickel, the streetcars did pretty well for themselves in the nineteenth century. Most people could not afford their own transport, and so anybody who wanted to travel within the city would have basically no choice but to accept the terms offered by the streetcar companies. This caused resentment among those who thought a nickel was too much to pay for what was often a crowded, dangerous ride. Basically, The New York City streetcars were like the Comcast of their time. The public got their comeuppance in the 1920s and 1930s, however, as inflation continuously cut down the value of the five cent fare and streetcar companies struggled to balance their books. Streetcar companies mounted a campaign to have the fare changed to a dime, but much of the public and political establishment was uninterested in helping an industry that had been so happy to exploit them when the shoe was on the other foot. When the mayor flatly refused their request for a fare increase, the streetcar lines cancelled several lines services to put public pressure on the mayor. The mayor’s response was to replace the streetcars with buses. And that was the beginning of the end for the New York streetcars. Of course, Schragg’s account only covers New York City. But in my opinion it is far more likely that the demise of the American streetcar was due to this kind of local politics than that it was due to the conspiratorial actions of car manufacturers. Cars were already gobbling up huge chunks of passenger travel by the start of the 1930s; the United States did not need any extra push into car dependence. Furthermore, my own research has revealed that the pattern Schragg describes played a role in long-distance transport as well. American railways in the early twentieth century were monopolies, and like the streetcars, the public and the political classes often saw them as monopolistic, exploitative, and generally untrustworthy. This eventually resulted in the creation of the Interstate Commerce Commission, which in 1920 was given veto power over any railway fare increases. This was absolutely crippling during the Great Depression, when the railways, faced with competition from the roads, couldn’t even adjust their fares without a lengthy series of government hearings. but when they tried to change the law to be more favourable, many of the railways’ complaints fell on deaf ears. This seems to be a very common pattern: Privately owned infrastructures tend to be monopolies and so they often arouse public anger. This leads to regulations restricting the actions of the companies owning those infrastructures, but the public anger continues. As soon as a new and exciting technology whose problems are not yet widely understood provides a viable alternative to those monopolies, the regulations make it very difficult for the old system to compete, while the distrust of the people who own the old system makes it very difficult for them to get the regulations changed. So no; General Motors probably did not buy out the streetcar systems in order to push the country towards car dependency. But that doesn’t doesn’tean that the story is not still interesting as a folktale. Why does it still have so much lasting power? I think it has something to do with portraying our present-day concerns about technology into the past. Today, the car-based transportation system is not in a very strong discursive position. It is not a monopoly like the railways of the past, but it has still aroused concern and condemnation due to things like climate change, local air pollution, congestion, accidents, road rage, noise, and the bulldozing of neighbourhoods to build highways. To put it bluntly: the moral status of our transportation system is not very good right now. But people seem to have trouble understanding that the moral status of technological systems can change over time. People who are opposed to the car system today tend to assume that the only way such a system could have come into being in the first place is by some kind of trickery. Similarly, railroads and municipal light rail have a pretty good reputation these days, and so when people note that they used to be more dominant, it’s assumed that their downfall must have been due to foul play. Whence the popularity of the General Motors Streetcar Conspiracy theory. The true story, that cars and buses might have actually looked like a pretty good idea in the 1930s, while trains and trams had a nasty reputation, is less appealing not only because it requires more nuance, but also because it has implications for the present day. If the Americans who so eagerly dashed towards a car-culture in the 1930s were so mistaken about it, then what does that say about the new kinds of infrastructure that get us excited today? It means that we might have to think much more carefully about replacing our existing technological systems with things like drone delivery, Google fibre, or 3D printing. It means that we need to be sceptical of anybody offering a quick technological fix to our problems today. We can still support radical new technologies, but only after a great deal more thought. Visibility Politics: Why polite traffic stops are far from innocuous. Last Wednesday, I noticed on twitter that the police in Warwickshire have been stopping cyclists to talk about visibility on the roads. This was intended to be an entirely non-punitive thing; officers engaged the cyclists in a polite discussion about the importance of visibility, gave them a free reflective armband, and sent them on their way. @AsEasyAsRiding I needed to wear a helmet when watching, due to the amount of times I just whacked my head on the desk. Cyclists and cyclist organisations tend to bristle at suggestions that they dress more visbily. 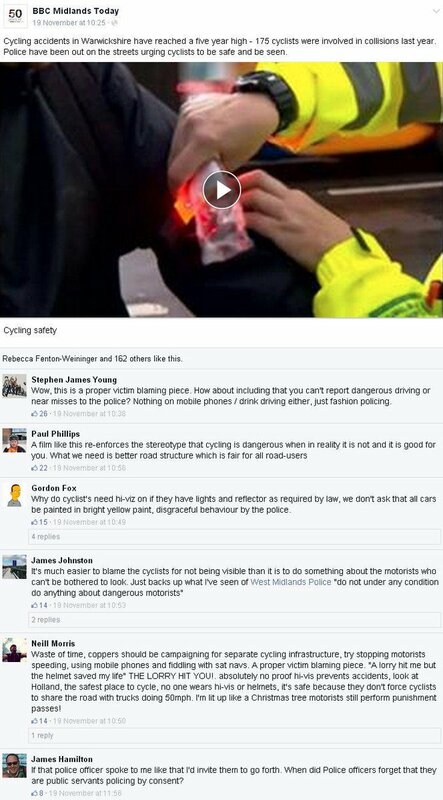 They tend to accuse police and other authorities that make such suggestions of victim-blaming, and point out that there actually isn’t much of an empirical case for the usefulness of high-visibility cycle gear. But to many people, this might seem bizarre. What could possibly be so objectionable about being more visible? Apart from being pretty much the tackiest thing imaginable when worn off a bike, a fluorescent yellow vest isn’t a massive hardship. And even if its actual utility is disputed, surely it’s better to be safe than sorry, right? Why would you want to put yourself at even the tiniest increased risk of an accident? Superficially, to somebody who does not ride a bike and does not understand all the nuances of transport safety politics, these arguments make a lot of sense. But as is often the case with these things, they oversimplify the situation. In this post, I’m going to try to explain why visibility campaigns are misguided at best and counterproductive at worst. I can approach this issue as a cyclist who steadfastly refuses to wear high-vis gear, but also as an historian of transport: The history of transport shows that these apparently well-intentioned safety campaigns can have surprisingly elaborate political implications. Illustration by Swedish artist Karl Jilg. Courtesy of Vox. 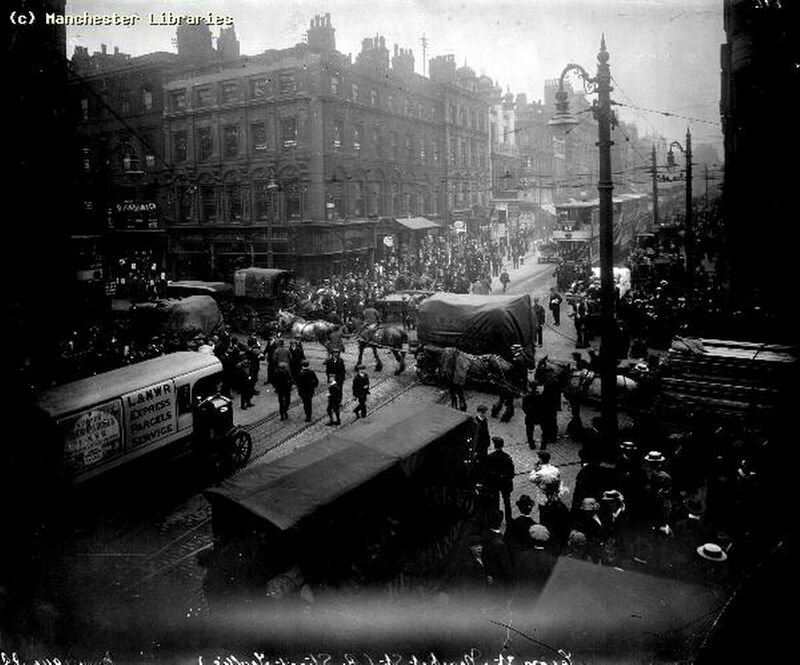 This picture, from Manchester Evening News, depicts a downtown Manchester street in 1914. Note the mixed use of the road, and the comparative freedom of pedestrians compared to today. Anybody who is intersted in the politics and history of transportation and urban space should pick up a copy of Peter Norton’s excellent book, Fighting Traffic. It details exactly how American cities went from looking like the picture above to the car-dominated cities depicted in the cartoon. The historical facts in this post are taken from that book. It turns out that well-meaning (or at least apparently well-meaning) safety campaigners have a lot to do how cars took over the city. When cars first appeared and began driving on on urban roads, the result was a lot of deaths. Pedestrians and, particularly tragically, children, were accustomed to being able to use the streets as they pleased, without having to look out for large metal vehicles passing by at high speeds. When that behaviour was combined with motorists’ desire to drive quickly, the results were tragic. This caused a public outcry against motorists, and various urban institutions began to look for solutions to the problem. The first few solutions attempted to balance the rights of cars with those of other road users, while still ensuring that traffic flowed smoothly. This made a lot of sense at the time-cars were a recent innovation and mainly a recreational machine for the rich. So urban authorities, including police, safety advocates, and a new cadre of traffic control engineers, set about restricting motor vehicles so that they would fit in safely with the rest of the road users. Speed limits, curbside parking bans, and even mandatory speed governors were proposed as a way of “taming” the automobile, and a few of these were implemented and have survived to the present day. This, however, did not suit drivers and their political lobby, who saw these restrictions as an attack on their freedom. And so they began an intense public relations campaign to push pedestrians off the road. A crucial element of this was the invention of a new word: “Jaywalker”. According to contemporary American slang, a “jay” was roughly defined an ignorant country person who did not know how to behave in a city. By combining this with “walker”, to describe pedestrians who crossed the road not at a crosswalk, motor interests were able to redefine a traditional right of pedestrians as evidence of idiocy. Jaywalking was not illegal at first, but the motor organisations used some very creative tactics to popularize the idea that pedestrians no longer belonged on the street. In one case boy scouts went around, stopping jaywalkers and handing out cards demonstrating the new safe way to cross the street at an intersection. In one particularly dramatic case in 1913 in Syracuse, New York, a man in a Santa suit used a megaphone to yell at jaywalkers he spotted. The implication was that jaywalking is unsafe and stupid, and that cars demanded new ways of being in the street. These tactics were roughly analogous to the polite approach now being taken by British police to encourage high-visibility gear. But it became more coercive over time. By the 1920s, cities had begun passing anti-jaywalking laws, and the ancient customs of the street were being rewritten to better accommodate cars. Car organisations also set up road accident information services, whose representatives would investigate car accidents, take notes on them, and relay their information to the press. This, of course, allowed them to selectively interpret the facts of these accidents as being the fault of pedestrians, cyclists, or other road users. These victims often had no opportunity to talk back, because they were dead. And by promoting these framings, car advocates were eventually able to change popular conceptions of the street to be more favourable to them and their members. The point of all this history is to illustrate that even the politest and most diplomatic of safety efforts still have a political implication: They inevitably present a particular interpretation of a safety threat, and by doing so, they propose the most effective ways of dealing with it. Car accidents, according to the 1920s motor lobby, were not the fault of cars on city streets, or of insufficient traffic laws, but of pedestrians and other road users who were unwilling to adapt their behaviour to new technology. 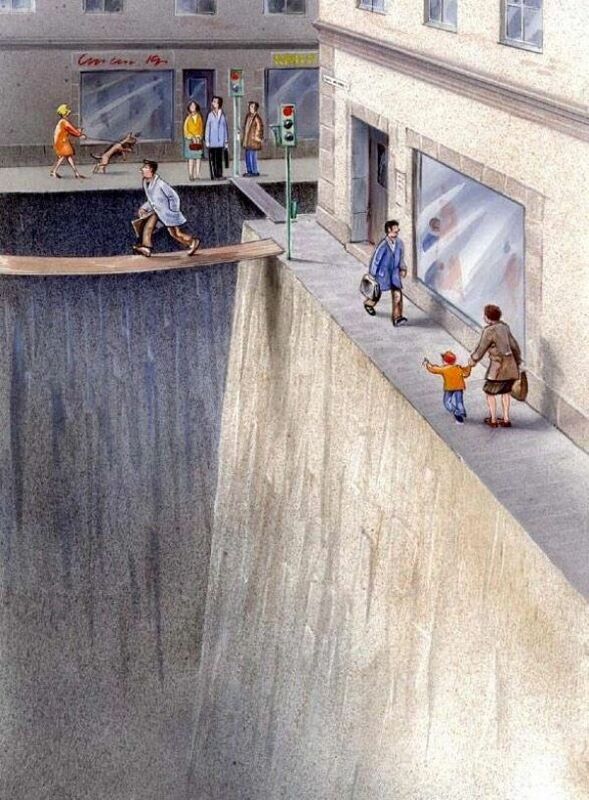 By framing the problem in this way, they framed the solution: Other road users should give way to motor vehicles. And so the great urban chasm depicted in the above cartoon began to open. Write laws that negate SMIDSY as a mitigating factor in traffic prosecutions. Motorists are responsible for being aware of their surroundings. Build more cycle lanes, and enforce the existing lanes more effectively: Drivers don’t have to worry quite so much about seeing individual cyclists if they recognize that a certain part of the road are off-limits to them. Use these kinds of polite traffic stops, but target them at motorists as well. Find some way to test how well motorists are looking out for cyclists, and use that as a basis to encourage them to look out more. Public relations campaigns emphasizing that motorists are responsible for seeing cyclists, regardless of what they are wearing. This post is not intended to demonise drivers. Most drivers, I expect, do keep their eyes peeled for cyclists. But there enough of them that do not that we should be concerned about normalising that by shifting the burden onto the cyclists themselves. So hopefully this gives some explanation of why I steadfastly refuse to wear a neon yellow vest. Because the high-vis vest is essentially the “jaywalker” of the twenty-first century. It uses safety concerns to argue for a certain conception of the rights and responsibilities of urban space. A few years ago, while riding my bike along the Don Valley cycle paths (a gorgeous urban cycle route that any cyclist in the area should check out), I was, to my confusion, passed by a man who couldn’t have been younger than 60 riding a rickety old bicycle without even pedalling that hard! Furious at this affront to my honour as a cyclist, I gave chase. Keeping pace with him for a few minutes was just about all I could manage. Frustrated and confused, I eventually noticed the high-tech looking plastic box sitting on the frame of the man’s bike. I had been racing with somebody who had the extra benefit of an electric motor. This was my first encounter with the increasingly popular phenomenon of the e-bike. In principle, e-bikes are a fantastic development. Cycling is an excellent means of alternative transport: It is sometimes faster than cars, it is certainly healthier and more sustainable, and switching to cycling might even make you happier. But cycling does involve a certain amount of privilege. To use a bicycle as a useful way of getting around, you have to be reasonably able-bodied and fit, and you have to live in a city where the distances and grades are manageable. E-bikes eliminate some of these requirements; allowing people to use bicycles who may not otherwise be physically capable of doing so. And even if the argument can be made that e-bikes are not, strictly speaking, active transport, their status as very light-weight electric vehicles means that their contribution to climate change will be minuscule, even compared to that of an electric car. The problem, however, emerges with the fact that very few technologies remain static. E-bikes are a relatively new development, and like most other new technologies, we can expect them to change considerably as they become more popular, and as the people who make them have more money to pay engineers and inventors to improve them. E-bikes currently exist as a kind of bricolage combination of cell phone batteries and bicycle technology, but they will evolve. And what they evolve into may force us to rethink what actually constitutes a bicycle. Notice how it still has pedals. This has, in fact, already happened in the case of motorcycles. A brief glance at wikipedia demonstrates that motorcycles are about as old as cars. These early motorcycles were literally motor-cycles: cycles with motors on them. Attach a motor and an extra stabilizing wheel to a penny-farthing, and voila! You’ve got a motorized vehicle. Motorcycles thus have a completely separate genaeology from that of the car, which was initially conceived as a horseless carriage. If you are at all familiar with e-bikes, then this should start to sound familiar. 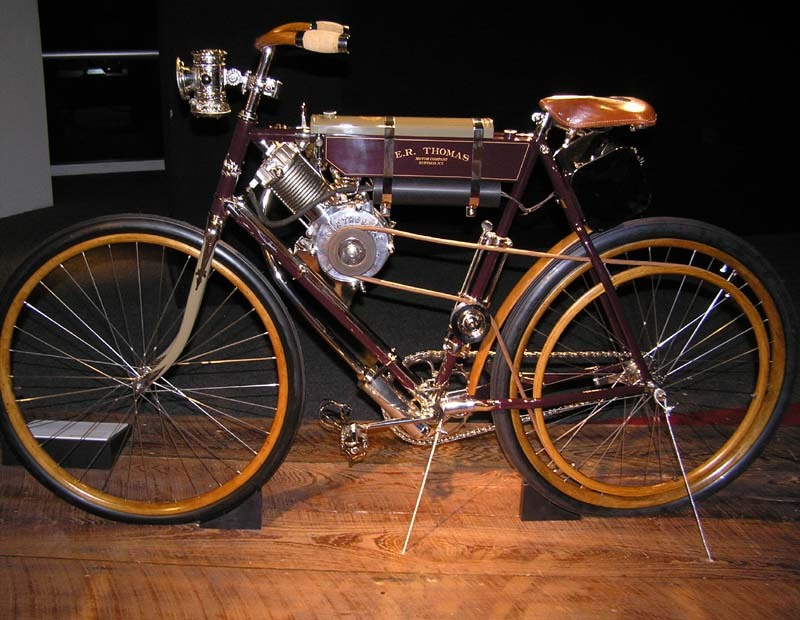 A 1910 Fabrique Nationale motorcycle. To make a long history short, motorcycles continued to look like bicycles for some time, and as bicycles became more sophisticated, so too did motorcycles. Gradually, the pedals disappeared, to be replaced with a stronger engine which in turn required a sturdier frame. Motorcycles began to diverge from their pedal-powered cousins. By the 1930s, motorcycles had taken on a distinct form of their own, with almost all signs of their pedal-powered history expunged in favour of more power, speed, and durability. And these, in turn, gave rise to the high-speed crotch-rockets that can often be seen in flagrant violation of speed limits today. 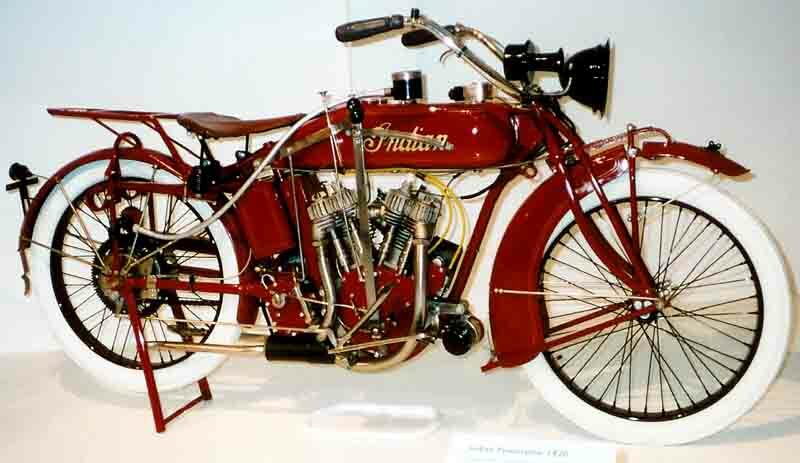 A 1930 “Squariel” motorcycle. By now, almost all signs of its bicycle ancestry are gone. This is a very crude history, mostly culled from wikipedia, so you shouldn’t take it as authoritative. My expertise is cars, trains and (occasional) aircraft; not motorcycles. But you only have to look at the pictures to see the clear trend: The metaphor of biological evolution is actually a very good one to describe the development of motorcycles and many other technologies besides: A mutation (innovation) caused one small population (motor bicycles) to diverge from a parent species (pedal-powered bicycles), at which point it was subjected to a different set of selection pressures (a different user base), and gradually diverged to become something completely different. As with biological evolution, the question of when a new species actually emerged is a purely subjective one-a crucial consideration when we consider the future of e-bikes. At this stage, there is no reason why e-bikes should not be allowed in the bike paths and bike lanes that make cycling a safe and enjoyable means of transport for so many people. We could justifably be accused of ableism or age discrimination if we did not allow them to use these spaces. But e-bikes, like motorcycles before them, will almost certainly evolve into something distinct from bicycles. They could become faster and dangerous for the slower cyclists around them. But at their point their riders may not take kindly to being pushed off of the bike paths they have become accustomed to using. Indeed, e-bike technology will likely evolve based on the assumption that they will be used in these spaces. The possible outcome could be that what was once bike paths will become a kind of second-tier road, dominated by electric motorcycles on which pedal cyclists will be, once again marginalized. This might not happen. Technological development is impossible to predict. But we do need to acknowledge that, one way or another, the technologies we use today will change into something else. And as they do so, the social practices and political structures that have built up around them might not change with them, or at least might not change in a way that resolves the problems caused by changing technology. Laws and habits are much harder to modify than bicycle frames. That means that when we think about how to integrate e-bikes and other new technologies into our society, we need to consider not only how they are, but also how they will be. This warning might just be standing in the way of technological progress. I did a presentation a few months ago music piracy, and some interesting historical facts came up that I think are pertinent to the endless debate on the subject. Typically, this conflict is understood to be a highly adversarial one between the music industry and its consumers. In our research, we decided to take a transitions theory approach to the problem; specifically to see what lawbreaking can mean for innovation. The historical evidence on this is surprising, and it reveals some important facts about copyright infringement that have not been adequately considered. It turns out that music copyright is actually a very novel institution, relative to the history of music generally. Up until the 1770s, artists could expect to have their music copied, re-arranged, shipped across the pond, performed, copied again, shipped back home, and re-arranged once more. They had no right to any recompense from this, and it was understood to simply be a part of the music business that they had to deal with. Romantic notions of authorial genius made such practices illegitimate with the first copyright laws, but these laws were usually ineffective. Near the turn of the twentieth century, home pianos created a massive demand for cheap sheet music, which certain individuals were more than happy to dater to, thanks in part to the invention of lithography. To combat this, sheet music companies had to resort to extra-legal measures including raiding the pirates’ houses while police looked the other way. Their findings in these raids eventually allowed them to frame piracy as a criminal conspiracy, facilitating the passage of harsher anti-piracy legislation. But this still had a limited impact and the sheet music companies were eventually forced to reduce their prices to compete with the pirates. Since that early conflict, piracy has been pretty much a constant presence in the music business, as have the recording industry’s quixotic attempts to eliminate it. While pirates were generally able to get away with their piracy at almost every turn, the recording companies did score one important victory, namely the gradual development of the legal system around music copyright, which turned a legal structure that didn’t even exist at the turn of the century into something quite coercive. Widespread bootlegging of records during the 1960s and 1970s, for example, prompted the music industry to lobby for the Rome Convention, which made unauthorized copying of music illegal. Later, the invention of the easily copyable cassette tape lead to the passage of even stronger anti-music piracy laws in the United States, but these explicitly allowed for home copying so as to preserve the legality of mix-tapes. In 1992, the record industry actually managed to completely block a new innovation-the Digital Audiotape-due to its ease of creating high-fidelity copies of music. With our 20/20 hindsight, we might dismiss the blocking of digital audio-tape appears as a half-measure which would be completely ineffective in the face of the massive disruption represented by the internet. For all its importance, however, the internet took a while to get itself noticed by the record industry. In fact, a stream of dot-com boom entrepreneurs looking to set up digital music services in the 1990s were nearly all rebuffed by the record companies whose intellectual property they needed. One quote from Sony Music executive Al Smith, addressed to one such entrepreneur, is particularly telling of the labels’ attitude: “Look, Kearby. My job is to keep you down. We don’t want you to succeed”. Smith’s message is clear: Sony and the other recording companies were comfortable with the music distribution system they had set up, and were not interested in adapting to new technology. And then Napster happened. In the midst of today’s heavy-handed approach towards piracy, it is easy to forget that the illegality of piracy was far from a sure thing at the turn of the millennium. Remember: existing American law explicitly made non-commercial copying legal and while Napster did intend to be a commercial enterprise. While it provided the infrastructure, Napster itself never copied any music. Napster expected to win the lawsuit, and to establish themselves as a legitimate business making money off of merchandising and concert advertising. Of course, this all collapsed when they eventually lost. While Napster was succeeded by a veritable parade of imitation services, such as Kazaa, Limewire and Bittorrent, another major development was in the works that would expand Napster’s legacy beyond piracy into the very structure of legitimate music distribution channels. That development was iTunes. Today, Steve Jobs gets a lot of credit for being the impetus behind the technical aspects of iTunes and the iPod, but he still needed access to the intellectual property held by the record labels in order to establish the service. It turns out that Napster had considerably softened the labels’ position on online music from the blunt dimissals of Al Smith a decade earlier. In fact, the music industry was so desperate to get some kind of cut from online activity that they actually gave Jobs a very favorable good deal on royalties. And that negotiation opened the floodgates for online services such as iTunes, Spotify, Pandora, CDBaby, and YouTube. It occurred at the turn of the twenty-first century almost exactly as it had at the turn of the twentieth: illegal copying forced powerful industrial interests to *ahem* face the music. This history tells us three important things about music piracy. The first is that by forcing sheet music producers to lower their prices, piracy at the turn of the twentieth century actually assisted in the realization of market efficiency. The second is that the laws that support the recording industry against pirates were, perhaps unsurprisingly, largely the creations of that same recording industry. This implies that they were intrinsically tied to a music distribution system based on the sale of physical objects such as LPs, cassettes, and CDs. Thirdly and perhaps more importantly for my case, without online piracy there was no economic incentive for the recording industry to embrace the internet. Does this mean that the music industry has no genuine ethical right to defend their intellectual property against pirates? Not necessarily. In fact, it depends on what you believe to be the real legislative purpose of music copyright. If you think copyright is an absolute and inalienable right afforded to artists and the companies representing them, then none of this history matters; criminals who violate the absolute rights of citizens should be punished. Alternatively, however, you might see music copyright as a strategic policy tool designed to incentive creativity. If this is the case, then piracy may very well be justified on the grounds that it has on multiple occasions forced the record industry to adapt to new innovations, both technological and musical, when they might not otherwise have done so. The nature of copyright is a philosophical question on which this post will remain agnostic, but there is one further point to be made from this history. The history of piracy and the recording industry has implications for technological transitions of all sorts. If the law is understood to be a part of a socio-technical regime as this case suggests it should be, then law-breaking can be a crucial means by which new technologies succeed in the market and transform systems and societies. To put it more bluntly, we may well be indebted to criminals for more than just our online music services. And that’s a fascinating thought. Borfe, L., 2004. Where have all the good times gone? The rise and fall of the record industry. London: Atlantic Books. Gronow, P., and Saunoi, I., trans. C. Morley., 1988. An International History of the Recording Industry. London: Cassell. Johns, A., 2009. Piracy: The Intellectual Property Wars from Gutenberg to Gates. London: The University of Chicago Press. Tehranian, J., 2011. Infringement Nation: Copyright 2.0 and You. London: Oxford. The End of the Automobile? Is an end to this in sight? I’m reading a lot of British transportation history these days in order to frame my research, and I have discovered in the process that many books on the subject are a bit antiquated. This can mean that they make hilarious predictions about the future (one proposed jetpacks as a plausible means of future transportation; another suggested hovercrafts), yet their datedness has a bit of value to me as a historian. While they may not reflect the most cutting-edge scholarship, these books can say a lot about the continuing history of the subject by revealing the author’s own prejudices. Such is the case with one 1975 book I am in the process of reading. Its author, Derek Howard Aldcroft, of the post-war era that “…in a period when passenger transport has expanded rapidly, the private road vehicle has swept all before it”. It makes sense that he would write that. In 1975, the growth rate in passenger-miles traveled by car had recovered from a small hiccup caused by the 1973 fuel crisis, and resumed the meteoric rate of increase that had persisted since the end of the Second World War. The use of trains and buses, meanwhile, had done nothing but stagnate and decline over the same period. From Aldcroft’s perspective, then, the long-term triumph of the passenger automobile may well have seemed a near-certainty. Of course, this would have come as sad news to the fledgling environmental movement that existed in the 1970s, and similar assertions are frequently made today, much to the chagrin of climate activists. But must we agree with Aldcroft? Perhaps we have learned something about the fate of the private car in the last forty-odd-years that Aldcroft may not have anticipated. It’s too big a question to answer adequately in blog form, but I’m going to try and clarify some of the relevant issues a little bit. I’m not going to bring a whole lot of new information to the table-I think that most people reading this will already know the facts I am citing. I am just going to frame the situation in a way that I think is productive for thinking about the question. First, it has to be noted that the automobile is a textbook example of a strongly entrenched socio-technical regime. There are strong cultural, economic, political, technological, scientific, and infrastructural forces that have become attached to the widespread use of the private automobile, and are not likely to allow it to decline without a fight. Existing sustainable transportation niches are constantly being frustrated by these forces. The fact that many roads were only designed with the safety of motorists in mind deters many people from taking up cycling. In many places, cultural norms strongly encourage the ownership of a car, and discourage the use of public transit. Train systems are unable to expand due to policymakers who are unwilling to allocate the necessary subsidies, while those same policymakers are often happy to spend millions on new highways. Massive urban sprawl makes it difficult to construct walkable communities. Meanwhile, niche-innovations designed to take advantage of existing infrastructure, such as the electric car, are hobbled by the fact that the internal combustion engine has a several-decade technological head-start, and a considerable cultural advantage. That being said, we would be foolish to completely discount the possibility of a major transportation transition taking place during the next few decades. Strong regimes can be broken up with the appropriate landscape pressures, and there are some pretty important landscape pressures currently acting on the car regime. The most obvious one is political: a lot of people are getting pretty concerned about the environmental impact of cars. Increasing smog problems in major cities and concerns about the environmental costs of fuel extraction, as is the fact that the private automobile has become symbolic of the high-carbon lifestyle practiced in the industrial west. Rising fuel costs are making the private automobile less appealing from a financial perspective than it once was. 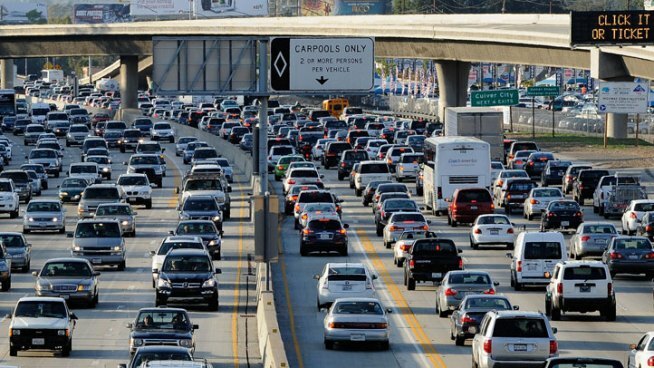 Congestion is becoming increasingly problematic in urban environments, leading some local governments to apply measures like congestion charging and car-pool lanes, as well as enhancing public transit services. Lastly, the economic crisis means that many people simply cannot afford cars, meaning that they are developing lifestyles that do not require them-a development which is scaring many car manufacturers. All of these things taken together could potentially start to break up the strong socio-technical entrenchment of cars. So what we have in the case of cars is a strongly entrenched regime holding strong against a few promising niches, but threatened by some important landscape events. This is exactly the kind of situation that has lead to major transitions in the past. The car itself seemed to many to be little more than a fad for rich people at the turn of the century, but as a niche-innovation it had a lot of potential, and when the world wars damaged the railroad regime and changed the industrial structure of Europe and North America, cars were well-positioned to capitalize on that change. This is not, however, a guaranteed outcome. It remains to be seen whether the existing pressures on the car regime will be enough to permit the development of a radically new transport system. I am not, of course, an entirely disinterested observer. I am concerned about the effect of cars on urban environments, air quality, and the global climate and I would like to see a more sustainable system replace them within my own lifetime. While I am not sure that this will happen, I can say that some recent evidence gives me reason for cautious optimism. A number of researchers have looked at transportation data from the last decade or so and noticed a surprising phenomenon: it seems as though the trend that Aldcroft noticed, in which car use was rapidly increasing over several decades, began to slow down some time in the 1990s, and may have even started to reverse itself in some places. The use of cars is still an order of magnitude higher than the use of trains, bicycles, and other alternatives, but we may be witnessing the beginning of a change. Whether these statistics truly represent a “peak car” moment leading to a major transition, or a mere blip, resulting from temporary economic conditions. I would ask skeptics to keep in mind, however, that firmly entrenched technologies can and have been brought low in the past. Before the car became popular, railroads were dominant for nearly a century. Before that, the millenia-long history of horse-drawn travel would have made the horse-drawn wagon seem as old and as resilient as time itself. And on the sea, steamships replaced sailing vessels after a comparable historical dominance. All of these systems became considerably entrenched over their long histories, and yet they were brought low in good time. Compared to them, the car’s sixty-year history makes it appear positively fragile. How much longer its history goes on, and how much more entrenched it becomes, remains to be seen. Aldcroft, D.H., 1975. “British Transport Since 1914: An Economic History”. London: David and Charles. Fouquet, R., 2012. Trends in Income and Price Elasticities of Transport Demand (1850-2010). Basque Centre for Climate Change BC3 Working Paper Series 2012-01. Newman, P., and Kenworthy, J., 2011. “Peak Car Use: Understanding the Demise of Automobile Dependence.” World Transport Policy and Practice 17.2. pp. 31-42. Sheller, M., 2011. “The Emergence of New Cultures of Mobility: Stability, Openings, and Prospects”. In F. W. Geels, R. Kemp, G. Dudley and G. Lyons (Eds) Automobility in Transition? A Socio-Technical Analysis of Sustainable Transport. London: Routledge, 2011. pp. 180-200. Wells, P., Nieuwenhuis, P., and Orsato, R.J., 2011. “The Nature and Causes of Inertia in the Automobile Industry: Regime Stability and Non-Change”. In F. W. Geels, R. Kemp, G. Dudley and G. Lyons (Eds) Automobility in Transition? A Socio-Technical Analysis of Sustainable Transport. London: Routledge, 2011. pp. 123-139. Zijlstraand, T., and Avelino, F., 2011. “A Socio-Spatial Perspective on the Car Regime”. In F. W. Geels, R. Kemp, G. Dudley and G. Lyons (Eds) Automobility in Transition? A Socio-Technical Analysis of Sustainable Transport. London: Routledge, 2011. pp. 166-179. Ehret, O., and Dignum, M., 2011. “Introducing Hydrogen and Fuel Cell Vehicles in Germany”. In F. W. Geels, R. Kemp, G. Dudley and G. Lyons (Eds) Automobility in Transition? A Socio-Technical Analysis of Sustainable Transport. London: Routledge, 2011. pp. 229-249. Goodwin, P., 2011. “Providing Road Capacity for Automobility: The Continuting Transition”. In F. W. Geels, R. Kemp, G. Dudley and G. Lyons (Eds) Automobility in Transition? A Socio-Technical Analysis of Sustainable Transport. London: Routledge, 2011. pp. 140-159.